Successfully Added Bluetooth Cassette Adapter to your Shopping Cart. 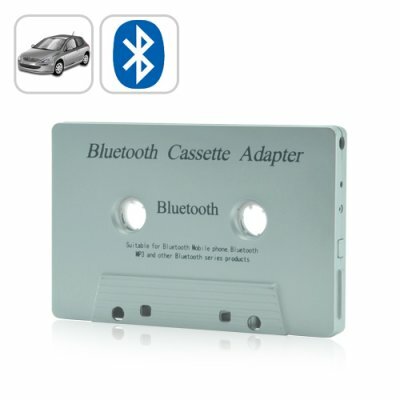 With this handy Bluetooth cassette adapter you'll be able to make and receive calls or listen to your MP3 player directly through your car’s speaker system. This allows you to keep your hands on the wheel and your eyes on the road while safely talking on the phone. That’s all there is to it. From now on whenever you receive a phone call it will be automatically sent to your cars stereo system. All you need to do is press the button once to answer calls or simply press it again to hang up. The best part is that unlike other Bluetooth cassette adapters this one actually produces excellent quality audio with virtually no signal noise at all. That’s because the CVOV-B17 is engineered using the latest CSR chipset from England. This proven technology gives you a strong and stable Bluetooth signal that prevents interference and gives you the highest audio quality possible from a cassette player. If you own a classic car or simply prefer a cassette player over an expensive CD player then you owe it to yourself to invest in this high quality Bluetooth cassette adapter. And since this product is direct from the factory you save more than 72% over the same brand name product. Resellers act fast and order now while supplies are still available. And don’t forget, this product is fully backed by our 12 month guarantee and is in stock now. Note: This great new product is available with factory direct low china wholesale price and we'll even dropship it to your customer. Can use in your portable cassette player also. Can stream music from your Bluetooth enabled MP3 player to your cassette player. Is there a built in microphone? Yes. This device uses a high quality microphone for clear communication. Can I get my own brand and logo printed on this device? Sure. If you are willing to order 300+ pieces then we can arrange that for you.